There’s not much on this page. It’s just a tracker of our net worth according to Personal Capital. A big caveat is that the “Other Asset” line is real estate, both our primary residence and rental properties, valued at Zillow’s estimate since this is what Personal Capital does. Going the other way, this figure also does not include substantial amounts of money owed to me (Logan), such as receivables from clients/lead buyers/affiliate networks, loans I’ve made to my parents and others, past due rent from tenants, expected insurance settlements, expected reimbursements from my employer, etc.
? 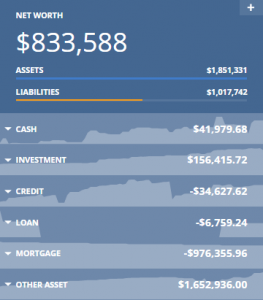 Do you want a nifty net worth tracker like this one that updates all your bank, investment, credit card, mortgage, and other accounts in real time? Then sign up for Personal Capital by clicking here! It is 100% free!